Take your artistry for a walk on the wild side with 32 original coloring designs that celebrate the awesomeness of animals. Inkspirations Animal Kingdom shares a variety of images of all things furry and feathered—from the savannahs to the woodlands, from the depths of the ocean to the treetops of the rainforest—a menagerie of animals waiting for your imagination to bring them to life. Perforated pages and a special lay-flat binding allow you to easily color, tear, and share your creations. Nature provides a dazzling array of colors in the animal kingdom—the bold stripes of a tiger, a tapestry of teals in a peacock's feathers, or the rainbow of colors in a toucan. While most of us are far removed from wild animals in our everyday lives, we can celebrate their majesty by adding our own burst of colors to the menagerie of animals in this book. Paired with inspiring quotes of lessons that we humans can learn from our animal counterparts, we hope this book inspires you to unplug, unwind, and unleash your inner artist. Yes, believe it or not, scientists have studied coloring, and they've found that it quiets the mind, calms our thoughts, and reduces stress. Coloring can induce a kind of 'flow,' or active meditation, during which you lose your sense of time and your worries fade away. So grab your favorite pencils or markers and let your imagination and creativity take flight. COLORING THE DETAILS—You'll notice each design is made up of unique doodled designs. You can color each individual element on its own in a separate color or you can fill in one larger group of shapes in one color. ©2016 HCI Books. All rights reserved. 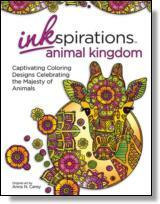 Reprinted from Inkspirations Animal Kingdom: Captivating Coloring Designs Celebrating the Majesty of Animals. No part of this publication may be reproduced, stored in a retrieval system or transmitted in any form or by any means, without the written permission of the publisher. Publisher: Health Communications, Inc., 3201 SW 15th Street, Deerfield Beach, FL 33442.